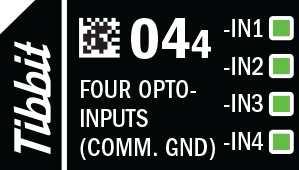 Note that these are not "isolated inputs" – they share the ground line with the rest of your system. Still, the optical stage isolates your system from noise, ESD, spikes, and other external influences. There are four green LEDs which are connected to four control lines. LEDs light up for the LOW state of control lines (i.e. when current passes through the diodes of the opto-couples).